Fee Dickson ‘My work is about spirit of place, and above all, light. Painting the moment of uncertainty, in between night and day; remembered, reflected, and layered light’ Fee Dickson’s work is rooted in place, be it the seascapes and ever changing wide skies of East Lothian, the vineyards of the Dordogne, or the busy streets and pubs of central Edinburgh. The linking strand that runs through her portfolio is a preoccupation with light, particularly twilight that gives rise to the most dramatic skies. Born in 1972 in Dunbar, Fee graduated from Edinburgh College of Art in 1999 with a Master of Architecture. Her architectural training taught her to see and taught her to draw. She painted semi-professionally for many years alongside her architectural work, and is now focussing fully on painting. She lives and works in North Berwick. 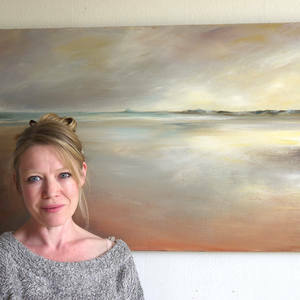 Fee has exhibited recently in East Lothian with Blues and Greens and Fidra Fine Art, and in Edinburgh with The Gallery on the Corner.